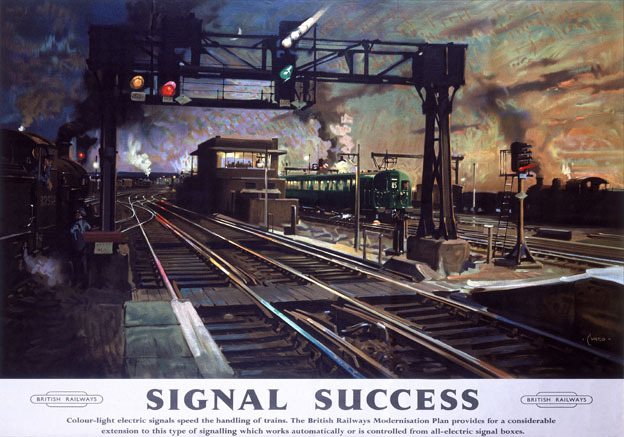 Vintage poster produced for British Railways (SR) c1960 to promote the company's extensive modernisation plan. 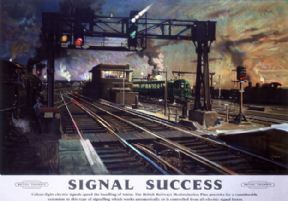 The use of electric signal lights was introduced to speed the handling of trains which either worked automatically or were controlled from manned all-electric signal boxes. The artist has chosen a twilight setting possibly to enhance the colourful new lights overhead with a steam locomotive hauling a freight train on an adjacent track. Artwork is by Terence Cuneo, son of the artists Cyrus and Nell Cuneo. He studied at the Chelsea and Slade Art Schools and in addition to a long career designing railway posters, he also painted portraits, ceremonial and military subjects.